In the second of our Thanksgiving Sides Series, we have chosen a perfect addition to the table. 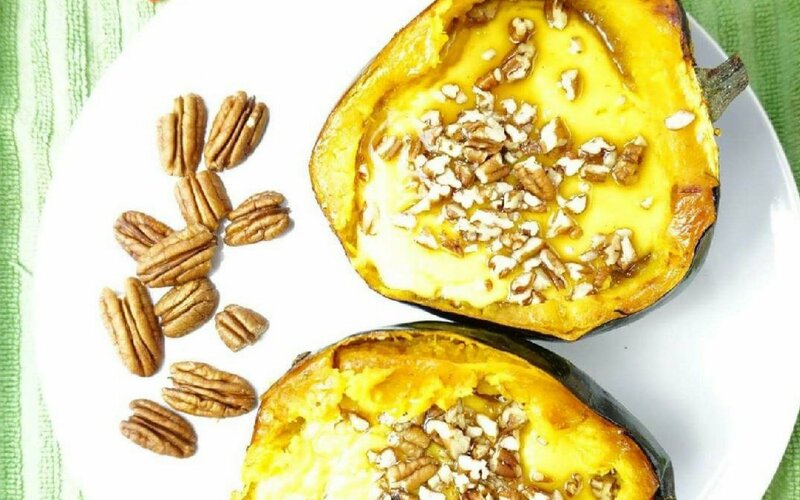 It is a twist on the twice baked potato except we substitute acorn squash. 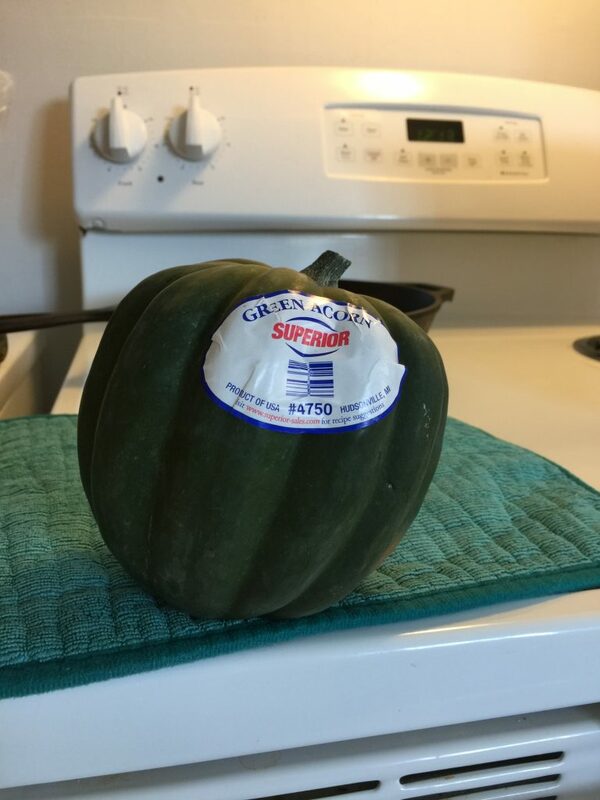 If you have never used acorn squash, it is a little tricky to work with, but is a delicious fall vegetable and is so beautiful. I think all varieties of winter squash are so nice to even use in your table centerpiece. They have all the vivid colors that welcome in the season. 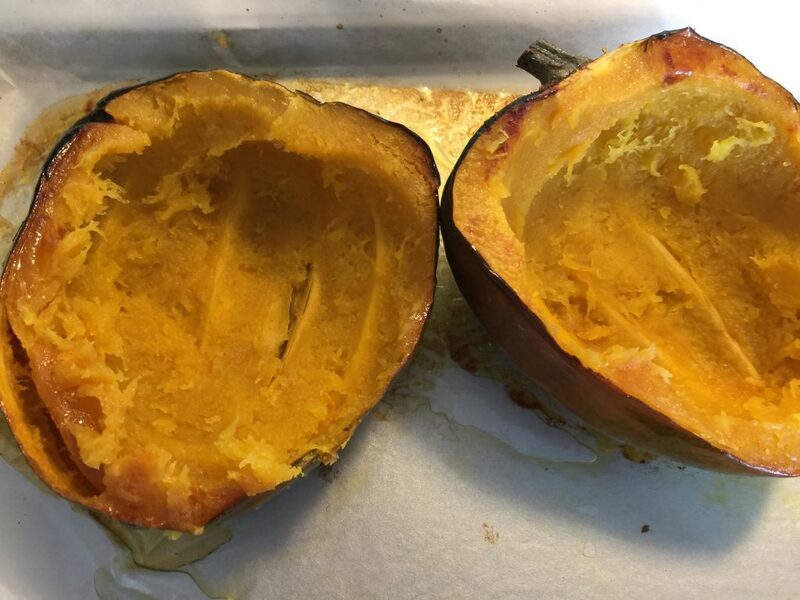 The first step in this recipe is to slice your squash. This is not an easy task because the shell is so tough. Use your sharpest knife and start by making a cut on one side at top of stem. Cut in between the rows. Once you have broken through one side, it is easy to get to the other. 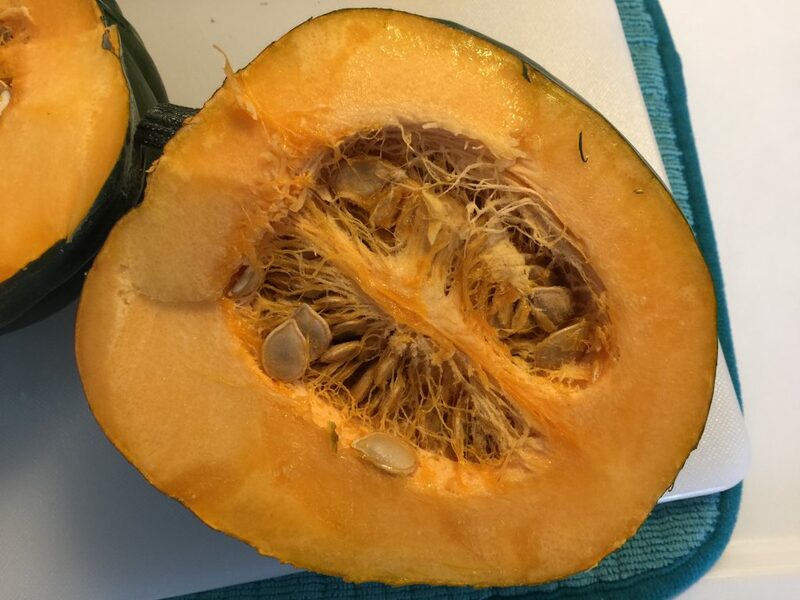 It is like cutting a pumpkin. Next, you will need to scrape all the seeds out. I used an ice cream scoop for this. Get all the seeds and “strings” out. Once you have them all scraped out, place them on a cookie sheet that has been covered in parchment paper. These can be messy when they bake and this just makes clean up easier. I buy two boxes of the paper during holiday season I bake so much. Now spoon half the melted butter all over the inside being sure to coat all the surface well. 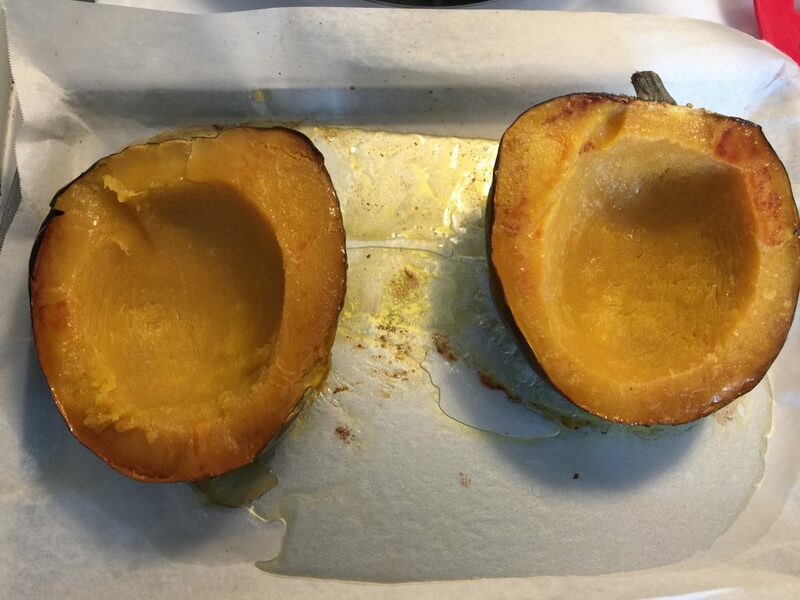 Turn the squash face down on your cookie sheet and put in your preheated 400 oven for 30 minutes. When you take them out, they will be nice and soft inside. Carefully flip them over and proceed to scoop out the inside to a bowl. 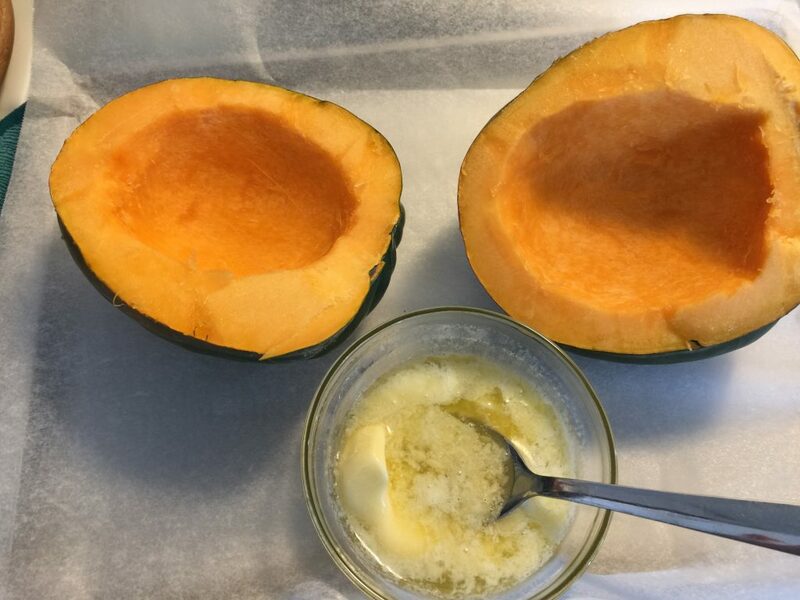 When removing the squash, leave a little so you have enough of a foundation to support the stuffing that will go back in. You can see I almost scraped too much out of the squash on the left. The bottom is down to the spine. I think it will be okay though. While my squash was baking, I boiled two small red potatoes. You don’t have to use red, you can use russet or even, heaven forbid, instant! But I like the flavor of the red. These little guys didn’t take long to soften up. 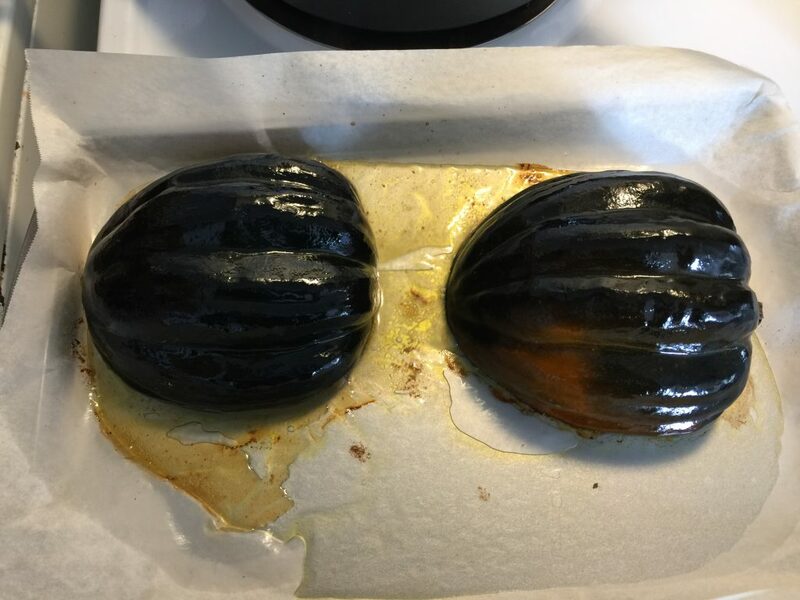 I boiled them in their skins because I thought that would be a pretty addition to the dish but my daughter reminded me she doesn’t like the skins so I had to peel after I took them out. Sometimes things like that happen when you cook. Most of the time you can rectify your mistake or alter your recipe. And then sometimes you just have to chuck it in the bin and start over! 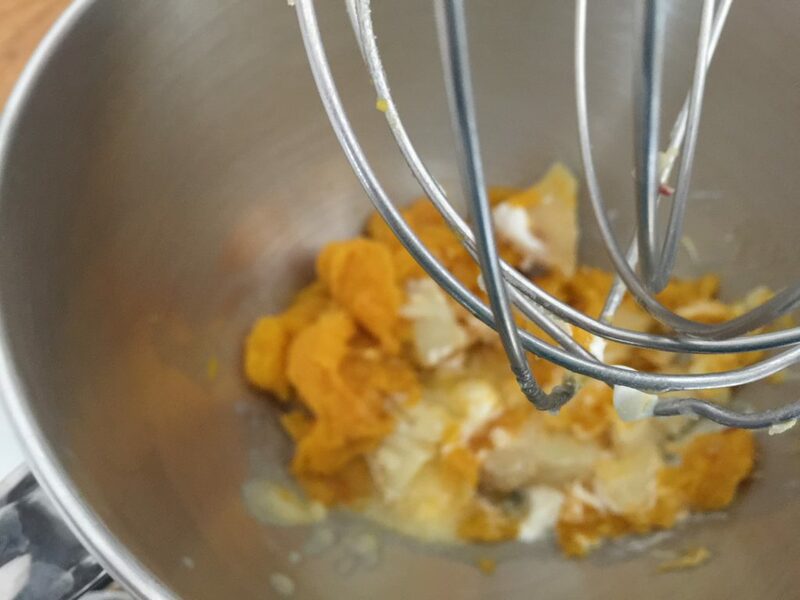 Once your potatoes have boiled, add all ingredients to your mixing bowl and stuff into your squash shells. Place under the broiler for about 5 minutes. Remove from oven. 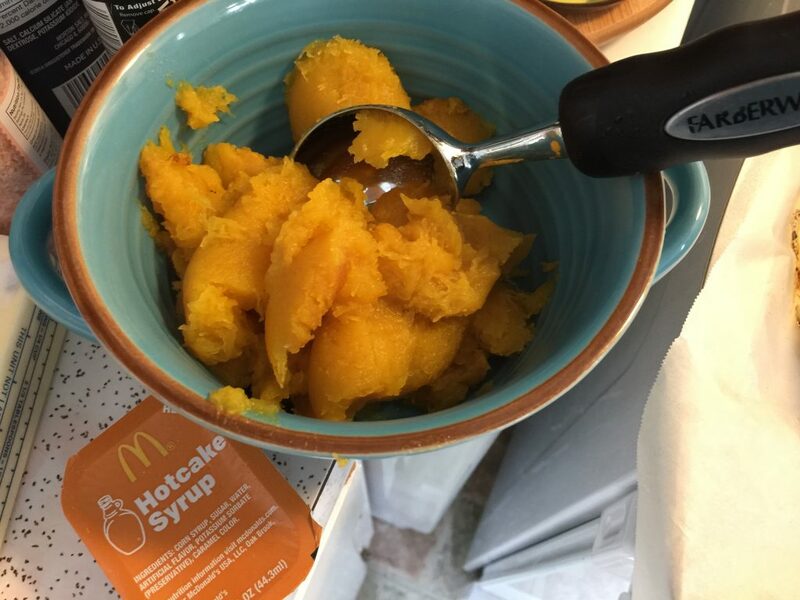 Melt the rest of your sugar and syrup stirring well and drizzle over the squash. Then add your chopped pecans. I think your guests will be impressed with this added vegetable on Thanksgiving. My daughter said it was fancy, but it really is probably one our ancestors ate at the first Thanksgiving. At any rate, it will look like you spent a lot of time in the kitchen when in fact, you really didn’t. Come back next Friday for another delicious side!